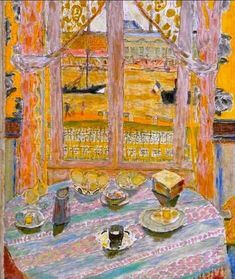 Ciwt had a stay at home day today which put her in mind of two famous French friends and artists of homely scenes, Pierre Bonnard and Edouard Vuillard. People often get their works confused. And for good reason. Both artists worked small-scale, abandoned perspective and concentrated on developing an "Intimist" style of decorative painting depicting their friends and families in tight domestic spaces packed with competing patterns. The way Ciwt keeps them straight is to look for an outdoor scene on the canvas. If there is a window with any sense of life outside the room, she knows she is looking at Bonnard. Even if there is a (rare) window or door in a Vuillard painting, the energy is concentrated inward. For instance, Vuillard's mother seems to be holding a fabric up to the sunlight on the right of his canvas above, but the subject of the painting is the fabric work being done inside the room. So far this distinction - along with Bonnard's happier colors when seen side by side - has served Ciwt well.